Morpheus’ drum solo wowed the crowd. Cypher is creatively directed, ambitious and expansive. It is also riddled with inconsistencies and plot holes. Half way through viewing I jotted down ‘very Cube / Equilibrium’. Only after I finished watching did I realize it was the second film made by the man who directed the similarly bold and low budget Cube. After securing the role Sullivan is sworn to secrecy. He cannot even inform his wife of his new role or KPIs. Furthermore from now on he is to be ‘Jack Thursby’ in all dealings with Digicorp staff and the outside world. A heavy burden, but ‘Jack’ rises to the occasion. He delights in crafting his own detailed backstory to use in interactions with the very people employed by the companies he spies on, and gains confidence that comes with knowing that you can do whatever you want with no repercussions – at least none done to the rep of Morgan Sullivan. The longer the ruse continues successfully, the bolder and more cocksure Jack becomes. Simple observe and report sessions soon morph into more stereotypical super secret spy stuff; codes, covert meetings, drop offs and passwords, all used in various seminars and functions all across America, while the loving wife at home becomes increasingly worried about ‘Her Morgan’s’ secrecy and sudden explosion of unexplainable travel. Cypher (first of all a pretty dumb and misleading name) is – as mentioned – above all an ambitious film. An attempt to craft a blockbuster on a budget, to be the director’s very own The Sixth Sense launching pad to celebrity and fame. Unfortunately while it is all very admirable several constraints hold it back. The fact is that while it tries something new initially, the plot ultimately ends up settling for an all too familiar ending, one which is either a cop out or a confusing mess. You’ll have to make your own judgment as to which. The acting is quite patchy also. Sure Liu is always reliable and mysterious (how many Asian women have freckles?) but her role is more an information tease here, a recurring reminder that the truth is orbiting nearby, but will we ever learn it is another thing. Jeremy Northam does all the heavy lifting and is fine in the role, but he is the almost unwitting The Spanish Prisoner style straight man, the well meaning rube trapped in a world of cryptic messages and clandestine discussions. And the less said about the cut price CGI the better. Just know that there are kids in Japanese primary schools making better computer generated stealth planes than the one on display here. John Carpenter, I’m looking at you. Vincenzo Natali is the man responsible here. He made Cube, then Cypher, then got a mid-budget flick called Splice, his first bite of the Hollywood cherry. Splice was not a huge cash cow, but it did manage to find a niche audience fluffed on the Species trilogy. Natali has undoubted talent and a knack for making a film seem more expensive than it perhaps was, but limitations as a storyteller have so far confined his films to ‘curio’ status. Cypher tries hard and has a couple moments, but it is a curio and no more. Final Rating – 6 / 10. As a believer in Cube, it pains me to see that a promising career is yet to produce nearly two decades later. 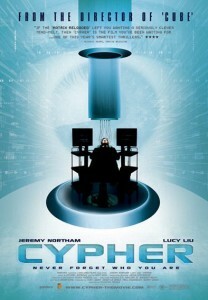 Consider Cypher another frustrating exercise in cinematic teasing.